Objective: Identify the location and contents of a first-aid kit. Present the information below on contents of a first-aid kit. Discuss procedures to use if a serious injury occurs. Show workers the locations and contents of first-aid kits in your workplace. Ask employees to suggest additional kit items. Invite a healthcare professional to participate in this session. Note: Review the location and the contents of the kit prior to training. Check for outdated or missing items. Knowing how and what types of first aid to use can prevent a more serious injury. Keep a Red Cross First Aid manual with the first-aid kit. 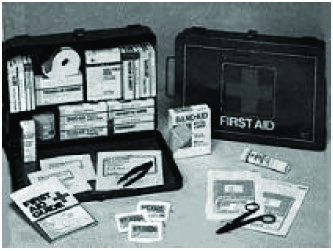 There are many types of first-aid kits available. Keep and maintain an appropriate kit on each major piece of equipment, trucks, and cars, and in the garage or shop. Kits should be inspected at least twice a month and replenished as necessary. The Red Cross suggests that workers be certified in emergency cardiopulmonary resuscitation (CPR), the method used to restore heartbeat and breathing. CPR may save the life of someone who has been injured or suffers a serious illness. However, CPR and first aid take training. An untrained individual who gives CPR or first aid may cause harm. Having an emergency plan in place saves time during an incident. Have a plan for every work location, including machinery sheds, garages, greenhouses, and fields. Know and practice what to do in case of an emergency. Stay calm and try to calm the victim. Shout or radio for help and tell a specific person to call 911 for Emergency Medical Service (EMS). Evaluate the victim’s condition and administer first aid or CPR as needed. (Only trained individuals should administer CPR first aid). Continue treatment until relieved by the EMS personnel. Do not move the victim except to protect the victim from further injury. Conduct a quick rescue without risking personal safety. Have a complete first-aid kit on all major implements and in all work locations. Know the emergency medical plan and keep it current. Know the 911 number and accident information.